Knowing how to handle cash flow is vital for the health and well being of any small business and restaurants often get a bad rap in the business world. Economist like to point out the high failure rate of new restaurants- estimates including two out of three restaurants close in the first year, or three out of four close in the first two years, and so on and so on. 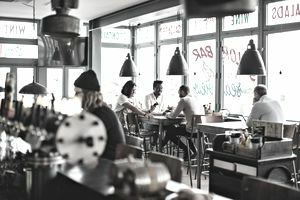 A major problem why new restaurants don’t make it past a few years is that owners and managers don’t know how to handle the day-to-day finances. Knowing how to manage cash flow, understanding a restaurant’s daily business review and keeping payroll and inventory under control are all essential parts of managing the day-to-day finances of any restaurant. One of the most effective tools any restaurant has is the ability to track food and beverage sales on a daily basis. A daily business review, as this type of report is often called, allows for a place to build a history of business. It can help analyze sales trends, payroll costs, customer counts and predict future sales. For example, when thinking about summer promotions, staffing and menu specials, you can review the daily sales from the previous year, looking for trends to help you plan for this year. Cash flow is the amount of cash coming in versus the amount of cash going out of your business on a daily, weekly and monthly basis. If you don’t understand this basic concept of restaurant finances, you put yourself at great financial risk. One of the most important aspects of managing a restaurant’s cash flow is to properly budget for upcoming expenses, such as rent, mortgage, utilities and food orders. Never rely on credit for more than a week from suppliers to buy food. This will help prevent you from overbuying food and spending more cash than you need to. Also, paying cash up front will often garner a small discount with food distributors. Like cash flow and daily sales, another area to be vigilant about is your restaurant payroll. Managing staff time is tricky. You need enough staff to give excellent customer service- both in the front of the house and in the back of the house, but you don’t want to over staff. Overstaffing creates two problems- you pay more and servers to make less in tips. So referring to your daily business reviews from previous years can help your staff accordingly. Also having a clear policy about staff asking before switching shifts can reduce the potential for overtime. While there are several big-ticket ways to save money at your restaurant, such as investing in energy efficient appliances, there are plenty of cheaper ways to save money every day. Switching to energy efficient light bulbs and installing low flow faucets are inexpensive ways to save money over the long run. Other ways to save money include keeping inventory low and updating your menu (making sure food cost is correct, getting rid of items that don’t sell).